Q : May I register the day of the event? A : Yes, you may. However, we accept only cash or checks as a payment. You have up to 30 minutes prior to your departure to register. Q: What kind of payments methods are accepted for your events? Q: Are we allowed to transfer our entry (bib)? A: Yes, entry transfers are allowed. Transfers have to be completed up until 30 minutes before the departure of your race. To complete a transfer, we need the full name, city of residence and birthdate of the person you are transferring it to. Furthermore, we need the consent of the person who is transferring his/her entry via e-mail or signed letter as well as an ID card. Photocopies are accepted. A: A registration is not refundable. However, entry transfers are allowed. It has to be completed up until 30 minutes before the departure of your race. Q: Can I change my distance? A: Yes you can change your distance, if you decrease it (example: from 10k to 5k), no additional fees will be charged. You have up until 30 minutes before your departure to make the change. However, in a case where the participant wishes to increase his distance (example: from 5k to 10k) he must pay the difference. The amount charged will be consequent to the date of the change. There is no refund. Distances changes can be completed when you go get you runners’ kit in store or the day of the event. Q: May I register for the 1k race even though I will not run with a child? A: Yes, people from all ages can register for the 1k race. You will also receive a participation medal as well as a meal. ** Please note that only the children under 11 years old are eligible to the podium ceremony in the overall category. Adults who wish to run along with their children may run for free, all though, they will receive no participation medal and no meal. Proceedings: at the start, adults must stand behind the peloton. After the start, parents who wish to run with their children can catch them up and finish the race with them. Q: Are there reductions for groups and enterprises? A: Yes, groups of more than 12 people are more than welcome! For further information, please click on the following link: https://www.coursesthematiques.com/group-packages/. If your group is composed of 15 persons and more please, contact us at info@coursesthematiques.com and a member of our team will get in touch with you. Q: Can buy many events at the same time? Q : When and where is my race kit pick-up? A: Usually, you can pick-up your race kit the Friday and Saturday prior to the event. You can also pick-up your race kit the day of the race. This information is available on the «Info course». Q : May I pick-up someone else’s race kit? A: Yes, you may pick-up a race kit of a colleague, a friend or a family member. However, you have to show his or her proof of registration. Q: Which document do I have to bring to get my race kit? A: You must bring your proof of registration. To have your proof of registration resent, write to the following e-mail address: support@inscriptionenligne.ca. Q: Whom do I contact if I can’t find my proof of registration? A: To have your proof of registration resent, write to the following e-mail address: support@inscriptionenligne.ca. Q: What happen if it’s raining or snowing? A: Our races are held whether the weather is good or inclement, except in the case of a force majeure that may compromise the safety or health of runners. Q: How much time do I have to show up prior the start of my race? A: If you have not pick-up your race kit in advance, you should present yourself one hour prior to the start of your race. If you already have your race kit, we recommend you to arrive at least 30 minutes before your start. Q: Are the events easy to get to with public transport? Is there a parking lot close to the site? A: Our races are taking place close to urban centers, therefore, it is easy to get to by car or with public transport. You will find this detailed information and more on the «Info course» tab on each of our race website and on the Facebook’s page. A newsletter will be send few days before the event. Please visit our website for our events’ calendar: http://coursesthematiques.com/. Q: What is the minimal speed per kilometer? A: For distances of less than 10k, there is no minimum speed. However, for security purposes, we require runners to respect the minimum speed of 8 minutes per kilometer for courses of 15 k and more. Q: Are we allowed to run with a stroller in your event? A: Yes, strollers are accepted, nonetheless, at the start, you must run behind the peloton for security purposes. Q: Are walkers welcome to your race? A: Yes, walkers are welcome to our race. Our event also includes a walking portion therefore there is a distinct medal ceremony. Walkers are required not to run intervals which means to alternately running and walking. Q: Are people with disabilities or reduced mobility welcome to your race? A: Yes, they are. If the person required assistance, the assistant will be allowed to run for free with a number with no time keeping bib or participating medal. However, his lunch will be provided. We ask people using a wheelchair to be at the end of the peloton. Q: Are there pace bunnies (pacers) on your course? A: There will be pace bunnies for the marathon and the half-marathon during our event. If you wish to become a pacer, please send an e-mail at info@coursesthematiques.com. Q: Where can I find the race’s course? A: The courses for all races are available on the «Info course» tab of each of our event. Please visit our website for our events’ calendar: http://coursesthematiques.com/. Q: Can I quality for Boston’s Marathon with the 42.2k course? 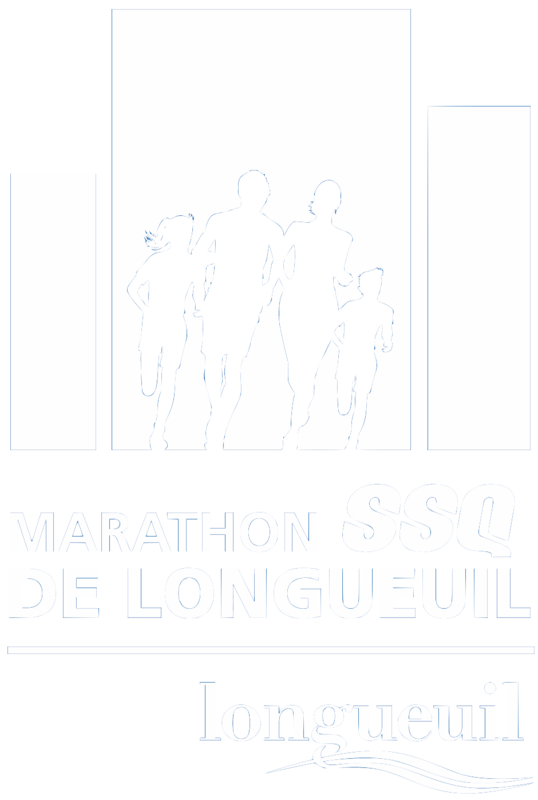 A: Yes, runners of the 42.2k of the Marathon SSQ Insurance de Longueuil are eligible to qualify for Boston’s Marathon. One the other hand, the 21.1k’s runners of the Marathon SSQ Insurance de Longueuil are eligible to qualify for New-York’s half-marathon. Our courses are flat and fast therefore it is easy to improve your time. Q: Are we allowed to wear headphones? A: You may run with headphones but it is not recommended for security reasons. Q: Are dogs allowed on the courses of your events? A: Dogs are allowed only during canine’s race (canicross). We also allow Mira dogs. Q: Is there a place where I can leave my personal belongings? A: We have a Baggage check where your personal belongings will be identified according to your bib number and keep safely. Even though the Baggage check is attended, we suggest not leaving valuable belongings. We do not take responsibility in case of loss or theft. Q: Will there be a child-care on site? A: No, there won’t be will a childcare service. Q: Is it possible to buy a t-shirt the day of the event? A: Yes, it costs $ 10 plus taxe at the Registration. Q: Can we buy an extra meal? A: Yes, it costs $10 plus taxe. Present yourself at the Registration to pay the fee, we will mark you bib to inform the responsible at the Food area. Q: Where may I have my race time? A: The results are printed on site during the event, they are also available in real time on Sportstats’ website: https://www.sportstats.ca/ . Q : There is a mistake on my time, what do I do ? A: The official timekeeping company is Sportstats. Send them an e-mail at: corrections@sporstats.ca with your name, last name, distance, name of the race and your approximate time. Please note that after the event, Sportstats adjust the results few days after the race.